The art in architecture and interior design covers and embellishes an extensive range of built structures; from homes to restaurants, cafés to hotels, hospitals to skyscrapers and so much more. When you go to a café, the ambiance and environment are as enjoyable to the senses as your favourite brew of coffee that you ordered. All over the world, the café culture is reminiscent of a time when cafés acted as a hub to connect peoples within a single community. Through centuries of evolution of culture and norms, nowadays, coffee houses are designed specifically to cater to a niche or a certain crowd. In this article we will explore few of the most unusually designed cafés around the world. For instance, there is a café which has been designed keeping in mind cat lovers, then another bold one located at an adventurous location, a prison-turned-café and what not. This week, we have curated a few of such calibre that are both pleasing and enticing to the senses of its visitors. Topolski is a café bar built under a railway arch which emphasizes its heritage through bright and psychedelic wall murals and paintings. Other interesting elements include a juice bar, sharing plates tradition, cocktail mixers, copper/brass decorative elements and DJs. Located in Hungerford Arches near London’s Waterloo railway station, this café-bar-gallery pays homage to Feliks Topolski, a former resident of the premises who was an artist and an illustrator. 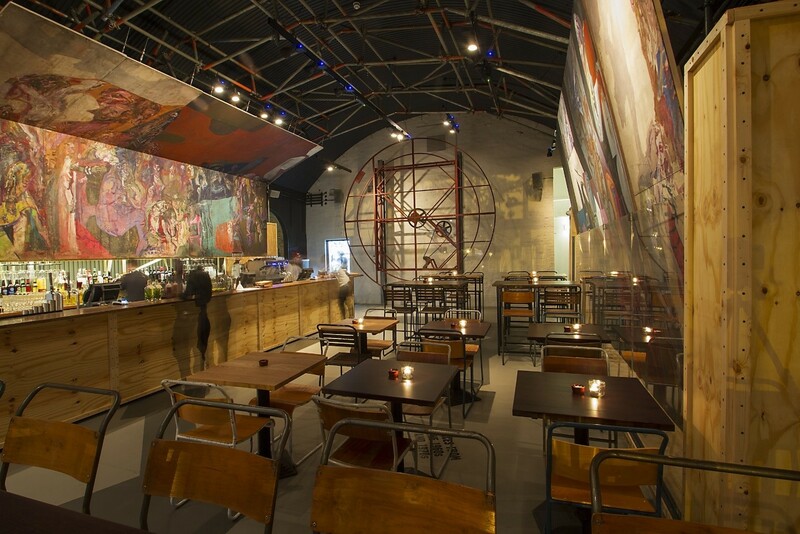 The café displays Topolski’s original works and if you’re an avid art lover, this café should be on your must-see list. 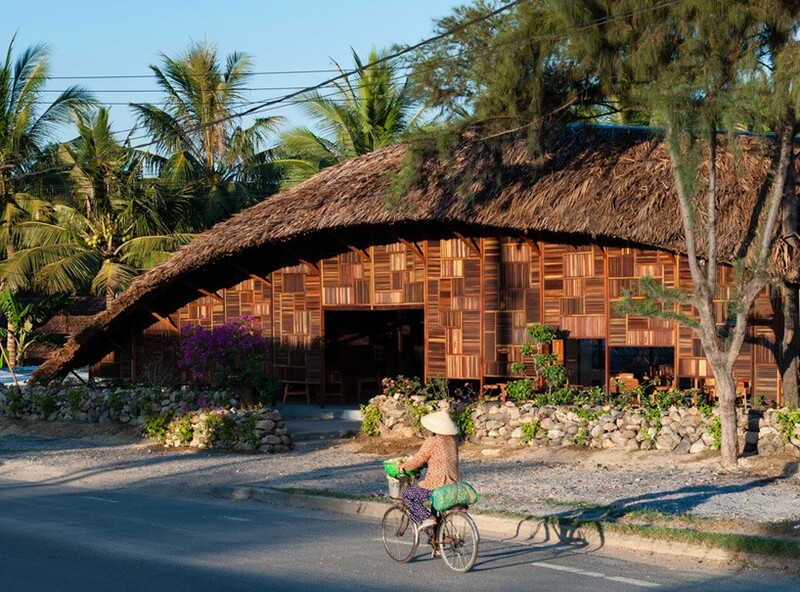 The Salvaged Ring Coffee House sits comfortably in the countryside of Nha Trang, Vietnam. It’s very easily spotted due to its location which houses it right by the side of the highway. The story of conception and creation of this café is what makes it into a masterpiece of art, architecture and perseverance. The Coffee House belongs to a carpenter who built it using scrap wood he salvaged through the years from many of his previous projects. Structurally, the roof of the café extends from one end at the highway to the other end where it canopies the riverbank which wows its visitors. The café takes its name from its ring-shaped roof which blends into its surroundings both material-wise and shape-wise. 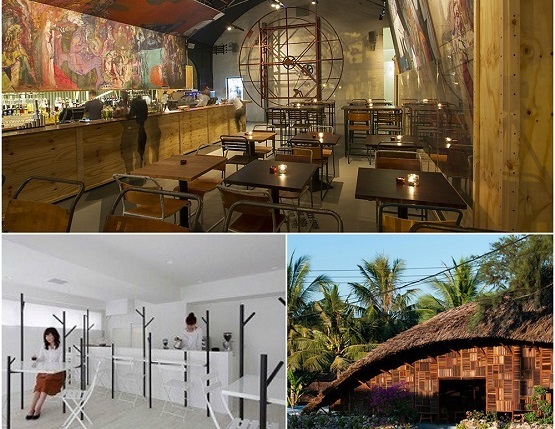 Due to its unique architecture, the Salvaged Ring Coffee House was nominated in ‘World Architecture Awards 2014’. The name ‘Café Ki’ means ‘a café of trees’ in the Japanese language. 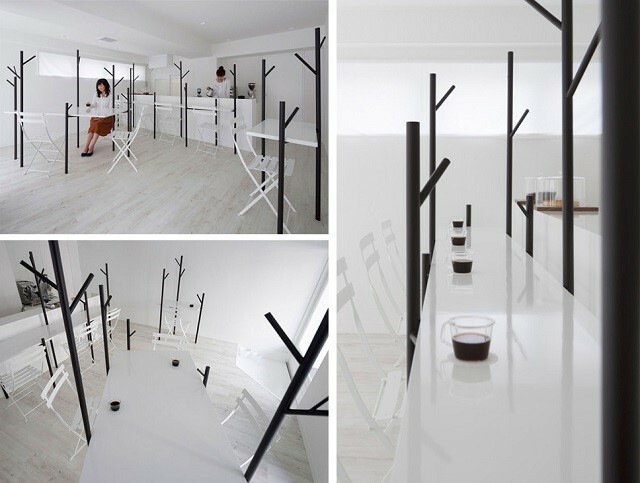 This monochrome establishment located in the capital city of Japan makes use of black wood poles made out of steel. The stark contrast between these ebony twig-like renditions and clean white walls and furniture may seem too minimal and dull to some visitors. However, it perfectly captures the values and elements of modern Japanese architecture which were laid down by the likes of Tadao Ando. For the guests, the simplicity and minimalism of the café offers a tranquil space to declutter their minds and simply enjoy their cup of warm beverage. As any interior designer would praise, it is a perfect antidote to the overstimulation of modern life. Stay tuned to AmerAdnan as next week, we’ll be showcasing some more unusually designed cafés.